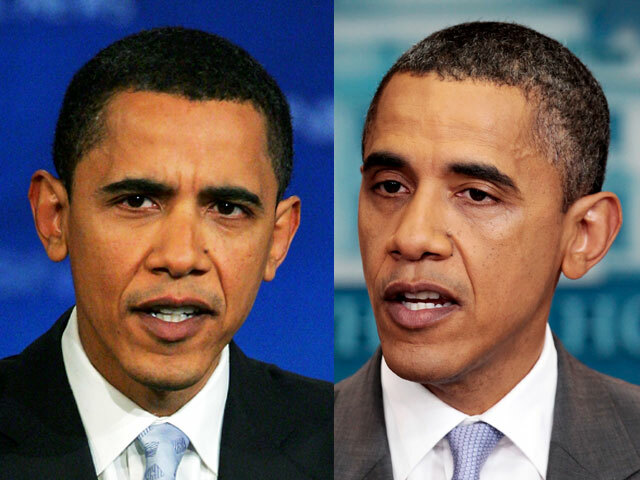 (CBS/AP) Do presidents age faster than most people? Lots of before and after pictures of dark-haired presidents who turn gray within a few years at the helm may lead you to believe so, but a new study suggests presidents actually live longer than their non-presidential counterparts. For the study, published in the Dec. 7 issue of the Journal of the American Medical Association, researchers compared presidents' life expectancies to longevity data for men the same age as presidents on their inauguration day. The study found that 23 of 34 presidents who died of natural causes lived several years longer than other people. The 23 presidents who lived longer than life expectancy projections died at an average age of 78. In fact, the first eight presidents were almost 80 years old on average when they died, at a time when the average life expectancy for men was less than age 35. That includes John Adams, who died at 90; James Madison, 85; and Thomas Jefferson, 83. "It's absolutely extraordinary that they lived this long," said study author Dr. S. Jay Olshansky, a researcher on aging at the University of Illinois at Chicago. Take a look at the living former presidents who have already lived longer than predicted, or likely will because they're in good health. Jimmy Carter and George H. W. Bush are both 87, while Bill Clinton and George W. Bush are both 65. "All of these presidents benefited from the trifecta of exceptional wealth, almost all were highly educated and all of them had access to medical care," Olshanksy told Reuters. Given that, their longevity isn't so surprising, he said. What about those gray hairs that pop up during presidency? "The graying of hair and wrinkling of the skin seen in presidents while they're in office are normal elements of human aging," said Olshansky. Stress can speed up those two outward signs of aging, and it's possible that job stress has made some presidents appear to age quickly. But the study shows that doesn't lead to an early grave. "We don't actually know if they get more gray hair or more wrinkles" compared with other men the same age, Olshansky said. "But even if they did, we don't die of gray hair and wrinkles." But some doctors, including Dr. Michael Roizen, chairman of Cleveland Clinic's Wellness Institute and co-founder of RealAge, Inc., think presidency speeds up aging. Roizen's "real age" concept suggests that age depends partly on lifestyle factors including stress and diet that either keep people young or prematurely age them. Roizen theorizes that presidents age twice as fast while in office. Roizen said Olshansky's study doesn't disprove that idea and only shows "that in order to run for president you tend to be incredibly healthy." Olshansky has even done some projecting about our current Commander-in-Chief, 50-year-old President Barack Obama. Given his age when inaugurated, Obama's life expectancy would be 79, but Olshansky estimates that Obama will live to at least 82 because of his education, wealth and access to top-notch health care.